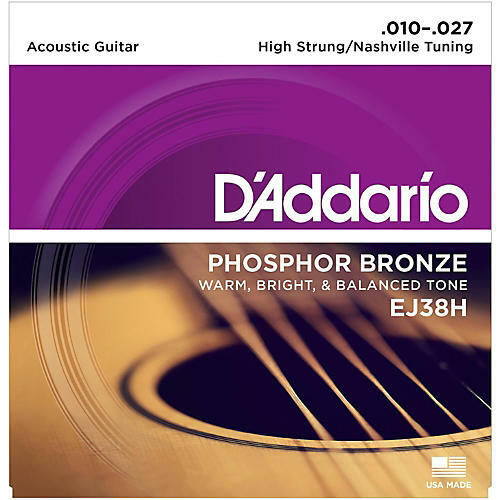 D'Addario EJ38H High Strung Phosphor Bronze Acoustic Guitar strings are specially gauged to accommodate Nashville Tuning, which is an affordable way to make a six-string guitar emulate the sound of a 12-string guitar. Unlike alternate guitar tunings, which require the player to learn different fingerings, Nashville "high strung" tuning is identical to standard tuning. The difference is that the four lower strings are tuned an octave higher. The B and high E are left unchanged. This clever tuning is much easier to tune and play than a real 12-string. D'Addario Phosphor Bronze Acoustic Guitar strings are acclaimed worldwide for their superb, long-lasting tone. Phosphor Bronze was introduced to string making by D'Addario in 1974 and has become synonymous with warm, bright, and well balanced acoustic tone. They are D'Addario's most popular acoustic guitar strings.